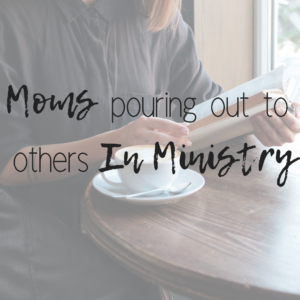 Pouring out to others by doing woman’s ministry is amazing. It’s fulfilling. It’s filled with God moments. The attacks of satan towards women in ministry are relentless. It can be tiring. It can be draining. It can be lonely work. Long days turned into long weeks… into long months had drained me. I just wanted someone to come along side me and be there to bounce ideas off. Someone to text and encourage me. Someone to breathe life into my weary bones. I ran to God, like never before. It strengthen my faith and realtionship in ways I’ve not known. My place has changed some. I am not the ministry leader quite like I was. My heart hurts for women in the midst of ministry. The ones feeling alone. Tired. Worn out. Running on an empty cup. If that is you, I would love to come along beside you and encourage you. I’d love to be a prayer warrior of your ministry. I’d love to cheer you on from the sidelines. I’d love to breathe a bit of rest and life into your weary bones. I’d love to remind you that you are fighting the ole devil and encourage you to not give up. God has a special place and people for you to pour into; My prayer is that this might be a place that your cup can get a bit of filling up here. Due to the nature and purpose of this spot on the site, your ministry might not be a good fit for this area of the website. We reserve the right to accept/decline. Also, keep in mind this is for women only. Please allow a week to receive a welcome email.